A film funded by the now no-more UKFC, The King’s Speech (2010) is a carefully crafted, understated telling of a story that brings humanism and empathy to the seemingly impenetrable and socially unconcerned royal elite. 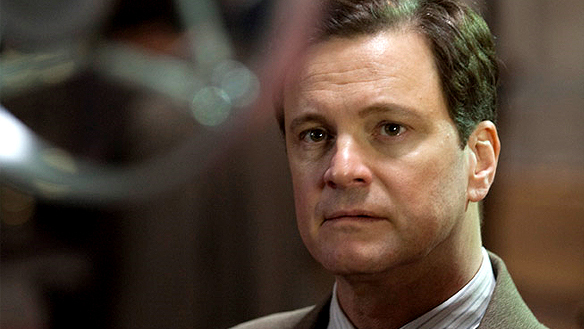 Without actually focusing on the problems of a life led from good breeding, The King’s Speech manages, through its key relationship between about to be King George VI (Colin Firth) and his speech therapist Lionel Logue (Geoffrey Rush), to touch upon the inescapable problems that beset those born of divine right. Grey, cold and misty, the film successfully creates a visual environment that mirrors the isolated, unfulfilled emotions of its lead. Unable to conquer his own subconscious blocks and break free from his debilitating speech impediments, King George is about ready to give up and, with the advent of his elder brother to the throne, hope for a life free from public speaking. Despite his lack of ambition and overcompensating inhibitions, wife Elizabeth (Helena Bonham Carter), is far from ready to give up and has found an unconventional Australian man who thinks he can cure the future King. With his brother renouncing the throne due to scandal in his personal life and in accordance with George’s increasing confidence, the film works towards not only the proverbial “King’s speech”, but the events that follow as war breaks out first across Europe and then the world. The tension in this respect builds brilliantly and culminates in an incredibly moving final sequence not because of the difficulty the King has in making the speech but because of the weight of his words and the known atrocity of what will follow. Brilliantly paced throughout and leaving its viewer with no uncertain understanding of the prescribed order of things, The King’s Speech is an achievement in subtlety and communicable affect. Ironically and wonderfully the film indicates how those in positions of power can’t ever be considered our equals as they must, in the very least, appear stoic and strong for the social classes they appear to deny. When such inhumane horror strikes a nation, there must be someone to look to for strength and guidance, irregardless of their being a construct of ideology and semiotics. Engaging viewing with brilliant performances across the board. The King’s Speech is released in Australian cinemas on Boxing Day, Sunday December 26 through Paramount Pictures.